Madagascar is one of the world's poorest countries. The country's economy is based largely on agriculture, mining, fishing, and clothes production. One of Madagascar's best known products is vanilla, which comes from an orchid and is used for flavoring. Vanilla beans take a minimum of two years to grow so they are quite expensive. 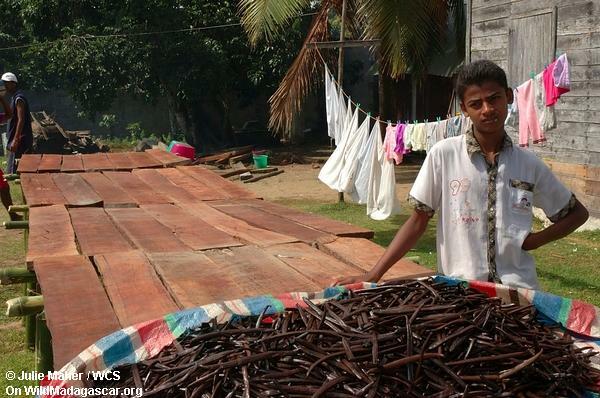 Despite relatively high vanilla prices, the average Malagasy makes around $1 US per day, while 70% of the Malagasy live below the world poverty line. Nearly half of Madagascar's children under five years of age are malnourished. Why is Madagascar so poor? There are a number of reasons. Under the past dictator, Didier Ratsiraka, the government was corrupt and stole much of the aid money given by other countries. Economic colonialism by the French meant the economy was closely tied to resource extraction (logging, mining, fishing), which often does not promote long-term economic growth since resources are depleted as they are removed. Lack of infrastructure, especially roads, makes it hard for farmers to get their products to markets, while Madagascar's geographic isolation from the rest of the world increases the cost of trade. Everything Madagascar produces or wants to buy from other countries must be shipped by airplane or boat. A weak education system makes it difficult for young Malagasy to find jobs outside the agricultural sector and very few people in Madagascar have access to technology or the Internet. Finally, damage to the environment has reduced the ability of Madagascar's farmers to produce large amounts of food. All these factors contribute to Madagascar's poverty. However, all is not lost. In 2005 Madagascar announced it had found large amounts of oil. Oil will probably be a key part of Madagascar's economic future along with mining, gemstone production (Madagascar has lots of sapphires), and tourism. There is hope that ecotourism, a form of tourism that minimizes impact on the environment, can help grow Madagascar's economy while protecting its natural areas and wildlife.